Book our snowmobile tour and enjoy snow, speed and the beautiful landscape of Åre! Experience the feeling of freedom when we float through the snow-covered landscape of the Åre region. We plan and organize snowmobile tours for all kinds of groups. You can choose from snowmobile tours for one hour tour to a several days trip, always with a possibility to have a nice outdoor lunch by the fire. Snowmobile safari is easy to combine with outdoor cooking or with any of our other activities. In our evening snowmobile tour called ”Skyline safari” we make an unforgettable trip under the stars with a magnificent view of Åre. On our snowmobile safari a snowmobile suit, snowmobile boots, gloves, helmet and insurance are included. Don´t miss out our brand new Snow Quad experience while in Åre! SEE MORE AND BOOK SNOW QUAD ONLINE HERE! For more information about snowmobile safari in Åre, go here! In order to drive a snowmobile you must have some form of driver’s license issued by the Transport Board (eg scooter, snowmobile, tractor card, plain license etc) and be over 16 years old. 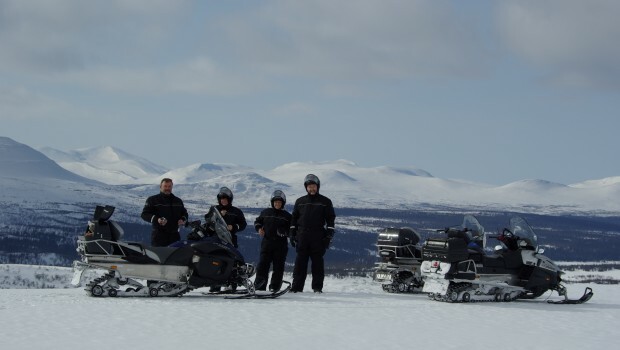 Do something unforgettable – join us for a snowmobile safari in Åre! Book your snowmobile adventure here!